Sister Kathleen Brabson, S.S.J., (formerly Sister Thomas Audrey), died Jan. 23 at St. Joseph Villa, Flourtown. She was 71 and in the 53rd year of her religious life. The daughter of the late Francis Thomas and Audrey (nee Burke) Brabson, Sister Kathleen attended Seven Dolors Grade School in Wyndmoor and Cecilian Academy in Mt. Airy, Pa. In September 1966 she entered the Sisters of St. Joseph, Chestnut Hill, and professed her final vows in 1973. 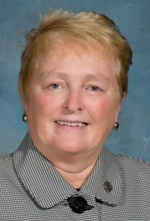 Sister Kathleen ministered in the Archdiocese of Philadelphia and the dioceses of Harrisburg, Trenton and Wilmington. At the time of her passing, she was president of Mount St. Joseph Academy, Philadelphia. Relatives, friends and members of the Mount St. Joseph’s community may greet the family on Monday, Jan. 28 from 9 to 10:15 a.m. at Immaculate Heart of Mary Church, 819 East Cathedral Road, Philadelphia. A memorial liturgy will follow at 10:30 a.m.
A viewing will also take place at St. Joseph Villa on Tuesday, Jan. 29 from 1 to 3 p.m., followed by the funeral Mass. Interment will be private. She was the sister of Patricia Brabson, Audrey Durkin (Dennis), Angela Lyons (Edward) and the late John F. Brabson. She is also survived by her sister-in-law, Jeanne Holt Brabson, nieces, nephews and members of her congregation, the Sisters of St. Joseph. Donations may be made in Sister Kathleen’s name to St. Joseph Villa, 110 Wissahickon Ave., Flourtown, PA.